Although each single city has its specific beauty, some towns are distinguished by its historical background and some by its beautiful nature. Azerbaijan's Shaki city is always in the spotlight of both foreign and local tourists with its picturesque nature and history. The town known as Nukha was renamed Shaki in 1968. 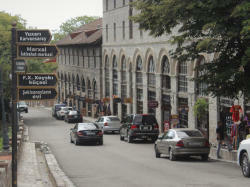 It is possible to visit the city situated 370 km far from Baku for about 4.5 hours by three roads. 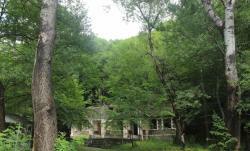 (Kurdamir, Agsu and Ismailli). The shortest route is Ismailli road. Drivers of sedan cars mainly prefer this road, because, the highway running through Ismayilli is beautiful and shorter than others. 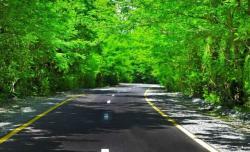 This part of highway is always cool even during the hottest days of summer, because leaves of the trees on the both side of the road do not let sunlight get through. Shaki is not too big. Two days are enough for going sightseeing. The residents of the city are very hospitable and ready to help tourists in any matter. The city is located in the southern of the Greater Caucasus, and its road is upside-down and not very wide. Even though all roads were covered with cobblestone in the past, currenty the main parts are paved. Some roads are being reconstructed due to setting of its sewerage system. The “arkhs” have been built along the roads so that rainwater flowed to the river. The river flowing through the city center gives a special beauty to Shaki. Shaki looks like Georgian Tbilisi both for this aspect, and for historicity. 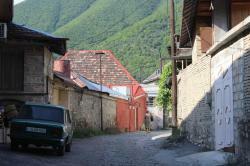 When you walking through the narrow streets of Shaki, you feel like you are inside the old Azerbaijani films. Almost, the Caucasus snowy mountains are seen from each street. Temperature of the city is cool and fresh because it is located on slope of mountains. You will not get exhausted from heat on summer days. Sometimes, continuous rain may be annoying. The museum built in 1762 is one of the places attracting the most attention of its guests and welcoming hundreds of tourists every year. The palace was built during the reign of Hussein Khan, the grandson of Chalabi Khan, who founded the first independent khanate in Azerbaijan. Although the palace is inside the castle, it is surrounded by additional walls. The most interesting fact about the palace is that during the construction no glue or nail was used. There are bird pictures, plot illustrations, fight and hunting scenes in walls of the two-storey palace. Tastefully decorated niches, mirrored fireplaces are an example of true art. The niches were decorated with illustrations drawn to the "Leyli and Majnun" poem of Nizami Ganjavi. The plane trees planted beside of the pool are 400 years old. They were planted in 1532. The width of the trees is 13.5 meters and the height is 42 meters. It is prohibited to cut the trees down as they included in the "The Red Book". 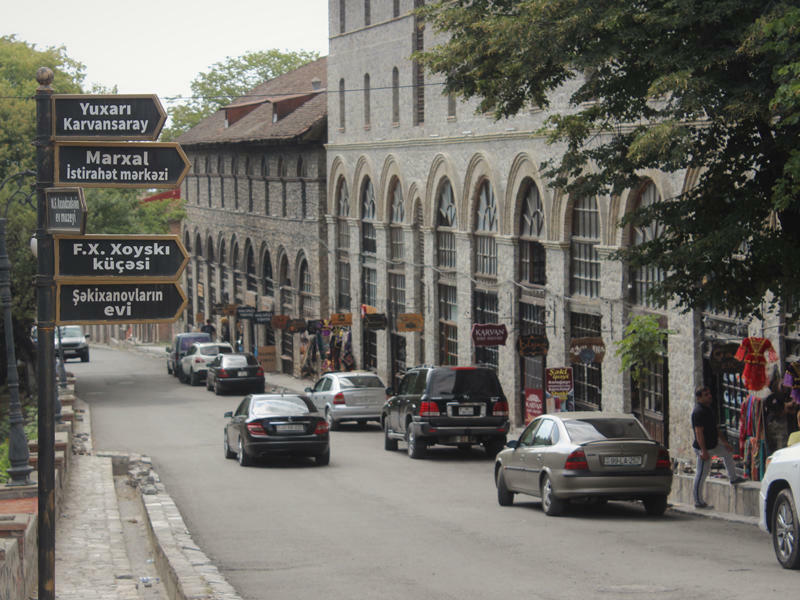 There is museum, Albanian temple, a cafe serving national and Shaki dishes, shops selling handicrafts in the yard. Horse riding and taking photos are allowed in the yard surrounded by castle walls. The most delicious treat everyone asks to bring from Shaki is “baklava”. Although, this sweet is named “bakhlava” in some Azerbaijani regions, however, local residents call it “halva”. It is one of the most preferred desserts by the city's guests. The exact information about the history of Shaki Halva has not been reached so far. There are currently more than 60 halva shops in Shaki. Many of them belong to local residents. When someone says piti in Azerbaijan, Shaki comes to mind. Piti is a meal made in pottery called "dobu". Although it looks like "bozbash" for the first glance, however they are absolutel different. The distinctive feature of piti which made from meat, chickpeas, and chestnut is crushing before eating. In ancient times, local residents have used the “rumka” for crushing chickpeas. Most times, when the piti is served, sumak with onion slices are also placed next to it. You don't feel hungry for 6-7 hours, when you eat “dobu” piti. The piti reportedly was given to the workers in ancient times due to its high calories. 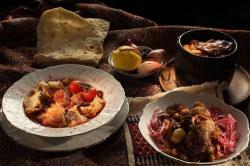 If you are in Shaki, you may choose “Gagarin” restaurant, which is located on way to the Shaki Khan palace, as meal in this restaurant is tasty and the view of the city is gorgeous from here. At the time Shaki has five caravanserais, however, only two of them - Upper and Lower caravanserais have been survived to this very day. The palace, built in the 18th century for travelers and caravans, is now used as a hotel and there is a restaurant, where national dishes are served. You feel gorgeous when entering the old palace, which is full of green trees. The ceiling of inner part of the gates is cupola, which is made from brick. 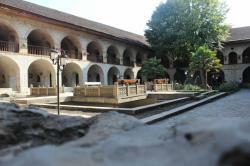 Caravanserai is one of the most favorite places which all of visitors choose here for photo shooting. 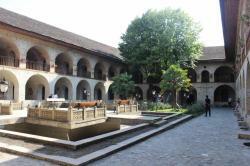 The Azerbaijani film “Hem ziyaret, hem ticaret” (Visit and trade), in which actor Haji Ismayilov co-starred with Nuriya Ahmadova, was shot in the yard of the Caravanserai. Even President of Turkey Recep Tayyip Erdogan has also been here. Gelersen-Gorersen fortress is located on the coast of the Kish river, about 4 km from Shaki city center. The path to the castle is tiring because it is upright. However, it is worth to be breathless for its amazing view.